The Cafe Ladder Back wood chair is the best choice for small venues, coffee shops, local small restaurants, and other commercial businesses. The chair’s size and design allows you to make the most of any space and to seat extra people in a small area. 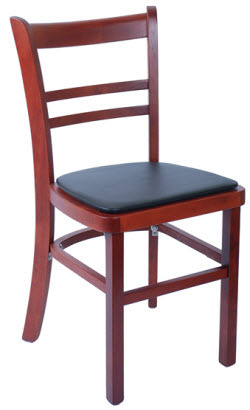 Our wood chairs are made especially for commercial use and constructed to withstand the heavy use common to the restaurant and hospitality industry. The chair is assembled with a Mortise & Tenon construction and reinforced with Metal L Shaped brackets. If you require more information please call (888) 998-4222. 15.5" W x 30" H x 15.5" D; Seat Height: 18"